Looking for the perfect person to guide you, Corporate Business Leaders and Solopreneurs, who love what they do but want to make an even bigger contribution. Do you struggle with motivation and procrastination which makes you feel confused and frustrated? I’m Julia Donnelly and what I do is support businesses/department leaders to identify their unique contribution so they can re-discover their purpose, re-ignite their passions and in doing this, re-engage their workforces resulting in increased profits. The Passion Test® is a simple, yet powerful tool to help anyone discover the things that matter most to them in their life. Chris Attwood and Janet Bray Attwood, co-authors of the #1 NY Times bestselling book, The Passion Test – The Effortless Path to Discovering Your Life Purpose, have helped tens of thousands of people to discover their passions and begin living their life-purpose. Just as every individual has unique gifts and a unique purpose in life, every company provides a unique contribution to its customers, clients and to the world. That unique contribution is the company’s purpose for being. Through our proven process, we identify your company’s unique contribution and build on what sets your business apart from the marketplace and industry. Secondly, we work with you on gaining clarity on what matters most. This process allows YOU to get clear on your “WHY”, which will help you focus on “WHO” you could market your products and services to, for maximum benefit to all. Internal and external customers. I look forward to learning more about you and your business. 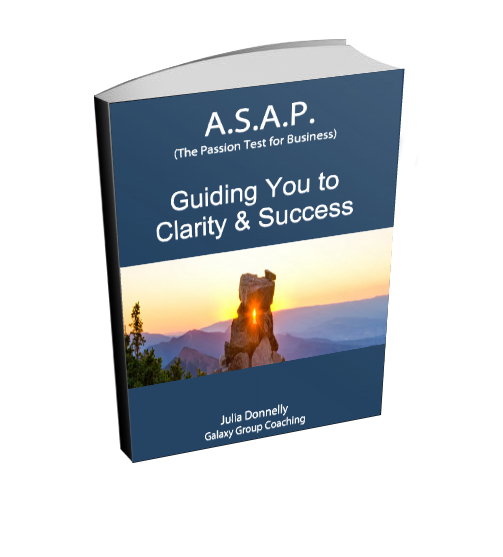 Guiding you to Clarity and Success! Anyone can read questions off a page but Julia added a much higher value to the process. She was easily able to help me move forward when I got "stuck" at certain spots, without putting words in my mouth. She's great at coaching the test taker to elicit ideas and thoughts without it seeming forced at all. Well done.